Working throughout Kent, London and the Home Counties, we provide everything from loft conversions and domestic property extensions to office refurbishments, painting and decorating, plastering and knock-throughs. 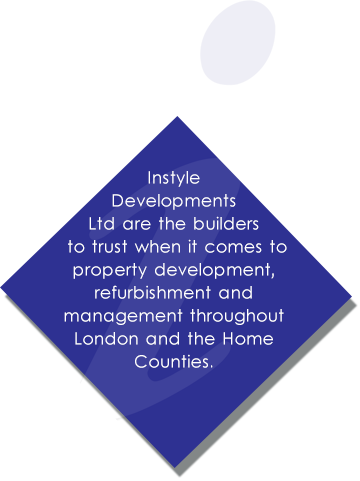 Focusing on quality and exceptional customer service, Instyle Developments continually delivers first class domestic and commercial constructions for very cost effective and affordable prices. Adding real value to any home or business property, our building work has become synonymous with reliability, safety and quality and is the reason why so many of our clients won’t rely on anyone else to meet their building requirements. We won’t take three months just to complete a simple loft conversion or home extension. Our experienced and dedicated builders are used to working to tight deadlines and thrive on taking on challenging projects, so no matter what your requirements, we guarantee to have the project finished on time and to your exact budget too. Call us today on 020 8300 8200 and receive a free survey and no obligation quotation from one of our skilled builders. We never charge for any site surveys or pre-project visits! Our base in London gives us the perfect opportunity to work on domestic and commercial building projects across Kent, London and the Home Counties. Our builders have recently completed projects in Barnet, Stevenage, Watford, Kensington, Enfield, Bromley, Croydon, Greenwich, Lewisham, Redhill, Colchester, Orpington, Stratford, Guildford, Islington, Romford, Victoria, Chelmsford, Chelsea, Putney, Slough and Reigate. If you would like any more information about our range of building services, please feel free to contact us. One of our dedicated team will run through your requirements and arrange your free survey and no obligation quotation.